Posted by ecointeractive in Cost Rica Vacation Interaries, La Fortuna / Arenal Volcano, Manuel Antonio. Day Nine – Depart for Home. The Eco Interactive Active Families series was developed for on-the-go families with active teenagers. 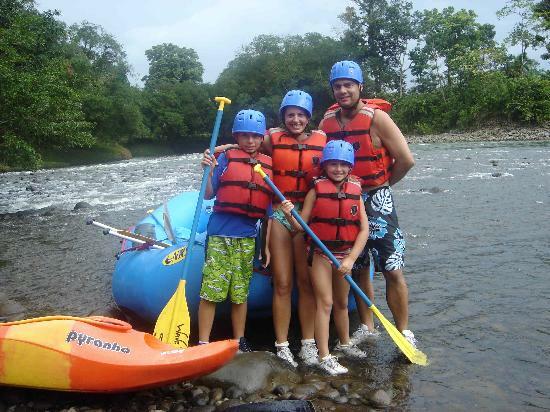 Costa Rica provides the ultimate in exciting and safe activities for your family. Feel the rush as you repel down cascading waterfalls, plunge down the whitewater on the Pacuare River, fly through the jungle on a zip line in the treetops, and explore secluded Costa Rican beaches by horseback. The options are almost staggering. We have designed our offering to provide our families with flexibility; the chance for teenagers to enjoy some independence as well as the opportunity for everyone to relax, have fun and try new things together. There is no other destination in the world with such a rich assortment of exciting activities as the area around La Fortuna Costa Rica. Set against the backdrop of the Arenal Volcano, one of the few active volcanoes in the world, this is a destination that has something for everyone. Your only regret will be that you did not have more time to delve into all that this area has to offer. The canopy tour experience is a favorite for families with children of all ages. This is a “not to be missed” experience for the active family. This tour is 100% above the ground. The tour starts with a horseback ride through open lands to the edge of the forest. Your bilingual guide will introduce you to unique features and wildlife that you will encounter along the way. Upon arrival in the forest, your family will harness up for their treetop adventure. Your safety is guaranteed with dual safety lines at all times, making this among the safest of all activities. With platforms high above the forest floor, you actually feel like you are inside a world all its own. In fact you are! This is an intimate experience with the forest canopy and you will soon forget that you are high above the ground. The canopy is home to many species and there is only one way to experience this unique habitat. After finding your way into the tops of giant trees, you will glide from tree to tree on steel cables from one platform to the next in complete confidence. This is pure adrenaline and thrills, yet an activity safe for all ages. The Río Toro will excite your family with a series of over 45 continuous class III-IV rapids. This excitement filled adventure will take you through tropical rain forest reaming with wildlife. You will spend more than two and a half hours rafting through unexplored, tropical wilderness on a personalized, small-group tour. The exciting Río Toro is located only 1 hour from La Fortuna. Canyoning in Costa Rica is a unique experience. Unlike other destinations, the rainforest setting adds another dimension to this adrenaline packed activity. We offer a series of descents down waterfalls immersed in the crystal waters of remote jungle waterfalls. With a total focus on safety, that includes safety lines and straps, you are harnessed in and descend on ropes down the face of shear rock walls. With an incredible array of wildlife all around you and the rush of the passing river, this is a safe and action packed experience that your family will never forget. For those that want to push themselves a little, there is nothing like the experience of mountain biking through a tropical jungle. We offer a number of mountain biking options to offer that adrenaline rush to those of all levels. Hike La Fortuna Waterfall. After breakfast we will transfer to the La Fortuna Waterfall for our morning hike. This slightly challenging hike will take us down the slopes of the La Fortuna Canyon to the base of this breathtaking waterfall. After our descent, we will relax or even take a swim in the pool at the base of the falls. Set against the backdrop of the majestic Arenal Volcano, the balmy waters of Lake Arenal are among the worlds’, finest for windsurfing. In fact, Lake Arenal is ranked as one of the top windsurfing destinations in the world. Windsurfing lessons are available for all skill levels or you can rent your own equipment and head out on your own. Manuel Antonio is the jewel of the Pacific. Set against the backdrop of pristine beaches, lush rainforest and exotic wildlife, Manuel Antonio has something for everyone. Along with the assortment of adventure activities, Manuel Antonio offers a range of fine restaurants, wonderful resorts and a vibrant nightlife. Quietly gliding through water is one of the best ways to engage with wildlife. On our challenging half-day journey along the coastline of Manuel Antonio you will explore remote and uninhabited islands and inlets that provide habitats for many species of marine wildlife. Sea kayaking provides an intimate encounter with life above and below the ocean’s surface. On this tour you may encounter dolphins, sea turtles, or flying fish. For a tamer kayaking experience, your family may choose to explore the protected estuaries of Damas Island, just 10 minutes from Manuel Antonio. As you safely navigate the maze of lush mangroves you are guaranteed an up-close and personal encounter with the amazing wildlife in this unique habitat. Within the Mangrove you will find an unsurpassed variety of creatures, including white-faced monkeys, exotic birds, and unusual reptiles. Among the most interesting is the famous Jesus Lizard, known for its unique ability to walk across water. Some of these lizards approach three feet in length. The mazes of mangrove canals create a feeling of anticipation, as you never know what you will find around each and every corner. Whether you are seven years old or seventy, beginner or experienced, we offer an exciting and safe surfing experience. For those that have never surfed, we will have you up on a board and surfing in no time. Before getting into the water our bilingual instructors will give you a safety talk and demonstrate the basic surfing techniques. When you are ready, an instructor will accompany you into the waves so you can try the real thing! For those of you that already know how to surf, we organize expeditions to world-class surfing beaches like Playa Hermosa, Playa del Rey, Dominical as well as our very own Manuel Antonio Beach. The surrounding mountains and jungles of Quepos and Manuel Antonio National Park provide a perfect setting for every mountain bike riding level. Guided tours are available to explore hidden waterfalls, traverse steamy jungle paths and thrill at glorious coastal vistas from the mountains above. Your bilingual tour guides are both expert cyclists and naturalists. During this tour your family will enjoy the mist-filled jungles, hidden waterfalls and unworldly views that await you in these adrenaline-charged adventures. In addition to the regularly offered mountain bike tours, we can customize an adventure to perfectly suit your family’s needs and experience level. Your family will enjoy our guided horseback riding excursions that will take you through the jungles and hills to nearby waterfalls, including the famous Los Tucanes waterfall. We also offer a unique horseback tour of the exotic Damas Island estuary. You will uncover the secrets of the forest by learning about medicinal and curative plants. Find toucans in our exotic primary forest. Enjoy a relaxing stay at waterfalls and natural pristine pools. After the ride, visit the waterfalls where you can swim and relax or walk the rainforest trails.